The Columbia Series LMT-50 Linear Motion Tandem Transducer is a unitized rugged package consisting of tandem linear variable differential transformers (LVDT's) with probe assembly. These units are designed so that the likelihood of a single failure affecting both output signals is extremely improbable. 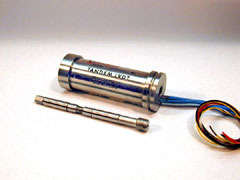 Primarily used in aircraft and missile control systems where redundant systems are a requirement, the Series LMT-50 Tandem Motion Transducers offer flight proven performance, even in the most severe environments. The LMT-50 provides high transfer sensitivity of 36 volts per inch at 6VRMS excitation. Ruggedized construction where all material is bonded and swaged including the stainless steel bore liner. Utilizing a premium insulation system for increased margin of safety for high performance reliability, the tandem LVDT provides the redundancy to guarantee the system integrity. 0.10": ±0.05" from electrical zero (EZ) Useable with reduced accuracy to ±0.01. 0.043 Watt Nominal: 0.06w Max.